Regarding Tuesday's phrenology post, this doesn't have to be used for the Spectator as Magician plot. You could very well have the chart out and use it on yourself as a way to get into a trick. As an Imp it's very versatile. Actually, the strongest version may be to sit there, pressing on your head like a weirdo and examining the chart, then you do a trick where you read their mind. Then you kind of shake your head and blink hard a couple of times. "Whoa, that's a weird feeling," you say. And then you ask, "Do you want to try?" They won't be expecting that. They will, likely, think you were just messing around, but then when you suggest they can do it to, that should be very intriguing And when when it ends up working, that should be even more powerful. That's a nice flow for a casual performance: You're doing something odd which gets their attention, you follow that up with a decent trick. They feel they have an understanding of the nature of this interaction and then you ratchet it up a notch by suggesting that not only were you serious about the phrenology stuff, but they can actually experience it themselves. That's strong structure. It would be as if you were 12-years old and it was Christmas Eve and your dad walked by while you were sitting in the living room. He seems to notice something through the window and he goes over to look outside. He's staring out the window into the sky. "Holy cow! I think I see Santa!" He freaks out a bit and starts jumping around with excitement. You're 12, you don't believe in Santa, you get that he's doing a bit. But then he says, "Come over here and look." That's the same as the moment where you say, "Do you want to try?" with the phrenology presentation. Both phrases seemingly take the "bit" one step past what's possible if reality is what they assume it to be. And that's where you're really going to capture their imagination, especially if you can follow up on the promise that there's more going on here than they originally thought. Back in 2015, when this site first went the way of being "reader supported," I offered anyone who purchased the first book a "Friends of the Jerx" post where I would write about whatever they wanted. That offer has long since expired, but I'm going to reinstate it for one long-time supporter, Cleo Ferris Lunt who has a short story in an anthology publication from her school's creative writing course. It's $3 for the ebook and the money goes to charity. On top of that, I thought the story was pretty good and memorable too. 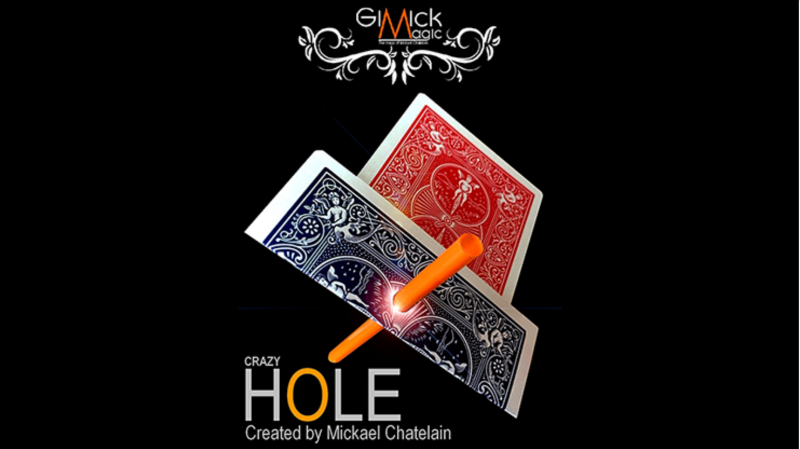 I like Mickael Chatelain's material a lot. It's super clever and the secrets are fun. However, if you ever wanted an image that encapsulates how arbitrary and un-awe-inspiring and meaningless a lot of close-up magic is, it might be this one. Yes, finally you can do a trick that calls to mind the primal imagery and the universal story that appears across cultures: the story of the one card folded around another card with a hole in it and a straw going through the hole. Here is something I used to do pretty regularly as part of an Open Travelers/Invisible Palm Aces routine. I didn't really have a set place to do it. I would do it as a lead-in to the routine, or a follow-up from the routine, or as part of the routine itself for the final ace. The idea is this. You talk about being able to absorb the cards into the flesh of your hand. You have a card palmed in your right hand, and with that hand you point at your left palm and say that there is a card in that palm right now. You extend your left hand and have someone touch it to see if they can feel the card. While this is going on, you backpalm the card in your right hand down at your side. Then you turn to the right and bring your right hand back into the picture palm up and touch your left palm with your right thumb as you make some comment about finding the card under your skin. Then you turn your left palm away from the audience and curl in your right fingers and "remove" the card, apparently from the somewhere deep within your palm. All these words are confusing. This is what it looks like. In real life I wouldn't do it in long sleeves as in this gif, because you don't want to give the person an easy explanation as to where the card came from.